Yesterday, March 12, 2012, in a San Jose, Calif. District Court, Yahoo filed a suit against Facebook alleging ten counts of patent infringement. It hasn’t escaped anyone’s notice that the filing comes during the hyper-buzzed buildup to Facebook’s big IPO, which is expected in May, or that both companies are current business partners. The technologies Yahoo is suing over are wide-ranging, and include, as worded in the case file, “messaging, news feed generation, social commenting, advertising displays,” and click fraud prevention and privacy controls. 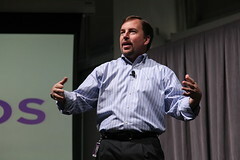 Above, Scott Thompson is seen; Thompson was named CEO at Yahoo only this past January.